Even though La Réunion has two volcanos, you will only hear one name when it comes down to this issue. The Piton de la Fournaise on the south-east side of La Reunion is one of the most active volcanos on earth and overshadows his bigger but inactive brother Le Piton des Neiges. The last big eruption of Piton de la Fournaise was in 2007 with a stream of lava floating into the Indian Ocean. A spectacular scenario that shut down the beach road for several months. Taking the long and winding road that leads to the volcano is part of the game and definitely part of the fun. The first effort is to get from the highway on the north or south side of the island to Bourg-Murat and further to Pas de Bellecombe. This is where it gets scenic and you could stop every few seconds to capture some breathtaking pictures. The landscape changes dramatically form big green trees to small and droughty vegetation until it gets more and more meager and rocky. Except for the last few kilometers the road is in excellent to good condition. From the car park you have a great view over the northeast part of the caldera. You are standing high above the caldera on the rim cliffs with an almost vertical drop in front of you. It seams almost impossible to get down into the caldera and the track that leads down is indeed steep and has more than 400 steps. Watch out for signs of warning, some of the tracks are closed for safety reasons during seismic activity. A visit to the Piton de la Fournaise makes up for everyone. You can either stay up at the caldera rim cliffs and enjoy the spectacular view, walk down the stairway and get a little impression of what the caldera looks like in close up or take the whole tour to the top of the active volcano on the other side of the caldera. Walking up and down the stairs will take you about an hour, climbing the top of the volcano is rated with 3 hours one way. We took a few little breaks in-between and reached the top after 2 1/2 hours and managed the way back even faster in about 2 hours. It's not only for your safety to bring some food and water, there are many lovely picnic places along the way. Be prepared for some rapid changes in weather conditions. We were glad to have some clouds shielding us from the burning sun. With black rocks all around you and not a single tree to give some shade, it can get pretty hot and exertive on sunny days. The path across the caldera and up the volcano is marked with white paint and is easy to follow. It is forbidden to walk outside the track. The lava is like a huge sponge with big air holes everywhere that can collapse anytime. From time to time it gets foggy and you will be glad to have a white spot to follow every few steps. We found this to be one of the best marked tracks we have ever been on and as long as you stay on the marks everything is fine. The last eruption of the Piton de la Fournaise was in 2010 and you can tell by the many different streams of cooled down lava how much activity has been going on. Take a look at the meager vegetation growing on the older stream. It will give you a good impression on how long ago this particular part has made it's way from the top to the bottom. I know some people just can't let go of their flip-flops, but walking on Lava is a whole different story. The ground is pretty loose and all those rocks are razor sharp. Make sure to bring some decent shoes, if you want to climb the top of the volcano. Definitely something you will not regret. If you decide to take the long way, great views will make up for all the effort. The higher it gets the further you will see. On days with good visibility you will be able to firstly overlook the whole caldera, than have a little look beyond and finally see the Indian Ocean towards the north-east side of the volcano. 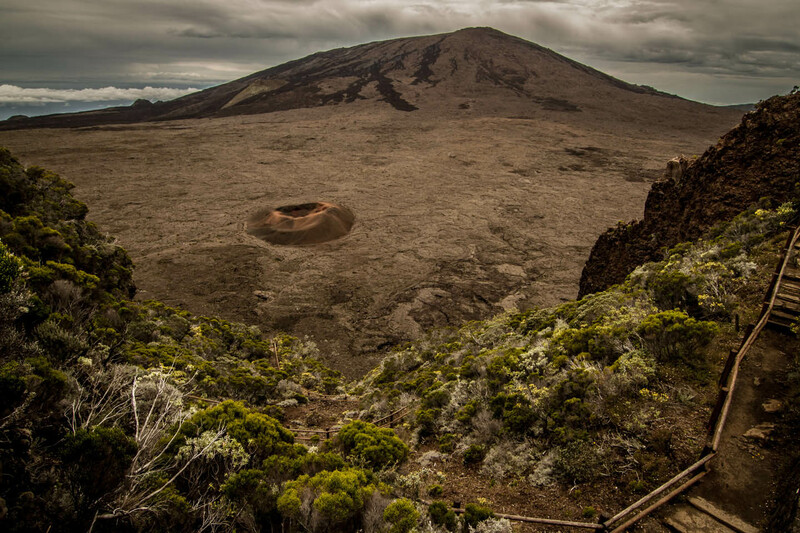 Once you are getting closer to the top, you might notice that there are different ways leading to the crater. Some of them are old tracks that have been closed because of eruptions and erosion. If you want to stay safe just follow the white marks. We got a little hint from a local guide and ended up taking a shortcut that brought us straight to the surveillance station close to the craters rim. The crater itself is huge and quite impressive. We didn't see much volcanic activity going on, just a few little clouds of smoke between the rocks at the bottom of the crater.If you are interested in glowing lava, you would have to wait for another eruption. But on the other hand you don't want to be standing in a hail of lava. The way down can get a little frustrating especially when it's hot and humid. You are overlooking the caldera calling into your mind how long you have to walk. Even the stairway up the craters rim all the way across the caldera is good visible . You can almost see your car on the car park waiting for you to get back. The big lava streams that were floating down the south-east side of the volcano during several eruptions are called Grand Brûlé. In order to see them, you have to make your way back to the highway N2 and drive in the direction of St. Rose. During several eruptions the lava has crossed the road many times and each incidents is marked with a sign, showing the year it took place. Only the lower part of the Grand Brûlé can be visited. There's a little car park and a viewing platform right next to the street. If you pick up some rocks and have a closer look you might spot some crystals shining here and there out of the black lava. Most of the time they are not very big and they will definitely not earn you a fortune, but might make up for a little souvenir.